- Dual purpose design, a zip around the crown opens to reveal a wide brim visor cap. Condition:100% brand new + high quality colors:grey, easy to carry suitable for season:summer, spring, pink, blue style: wide brim sun hat gender:female Popular elements: unique dual-purpose design, Foldable and Changeable design Free Size Super strong-protection for face and neck With a very stylish bow at the rear Foldable, Wide Brim, autumn Fashion korean style women/ladies/girls foldable sun Block Anti UV Protection Sunhat Large Wide Brimmed Floppy Fold Beach Sun Hat Cap Visor with Butterfly Knot. Unique dual-purpose and folding design, bright color, perfect for golf, tennis or fashion beach and leisurewear; A perfect summer gift for your lovers or friends.100% brand new;made of 100% cotton material, comfort, features skin-friendly, breathable, SUN protection and Anti UV. One size with a useful Velcro adjuster at the rear; With a very stylish bow at the rear. - Suitable to wear in Spring, Summer and Autumn. Sun protection, Anti UV. Feature: material:100% Polyester Size: about 4. 53 inchesbrim Depth: 4. 72 inches diameter: adjustable, 2087 inchesmin package: 1x hat note: As the volume is a bit bigger, the hat may have creases in packaging or in transit, which is normal. Dual purpose design, Disconnecting the zipper is Visor cap. Comfortable to wear. Ironing will make it recovered. Foldable, portable. Simplicity - Unique 2-in-1 design - features a zipper that removes the top part of the hat away from the visor section, so you can wear it either as a hat to cover your head or simply as a wide-brimmed visor. One size fits most - sun visor hat circumference 21. 2", height: 3", edge: 4" can be adjusted with its' velcro back closure. Suitable to wear in Spring, Summer and Autumn. Uv sun protection - provides extra uv protection from harmful sun rays by shielding your eyes & face with its' long visor bill & helps you stay cool as you enjoy your outdoor activities in the sun. Storage & travel-friendly - this ladies visor sun hat is foldable & packable while still maintaining its shape, its compactable size makes it easy to store anywhere & carried in your bag on-the-go for travels. Simplicity Women's UPF 50+ UV Sun Protective Convertible Beach Visor Hat - Versatile accessory - our foldable summer visor hat is perfect for various outdoor activities such as golf, camping, picnicking at the park, tennis, hiking, and more; It also makes a great gift for friends and family. Comfortable to wear. Foldable, portable. Sun protection, Anti UV. Simple, unique, 2 in 1 removable visor hats. Perfect for various outdoor activities such as hiking, gardening, and biking. - Uv sun protection - provides extra uv protection from harmful sun rays by shielding your eyes & face with its' long visor bill & helps you stay cool as you enjoy your outdoor activities in the sun. Dual purpose design, Disconnecting the zipper is Visor cap. Storage & travel-friendly - this ladies visor sun hat is foldable & packable while still maintaining its shape, its compactable size makes it easy to store anywhere & carried in your bag on-the-go for travels. Versatile accessory - our foldable summer visor hat is perfect for various outdoor activities such as golf, hiking, tennis, picnicking at the park, camping, and more; It also makes a great gift for friends and family. Material: Polyester Cotton. Size: hat circumference: 56-60cm, Hat brim: 11cm. Feature: fashion women/ladies/girls foldable sun block anti uv protection sunhat; Large wide brimmed with butterfly knot, allowing heat to escape and air to flow; Lightweight, protect your whole face and neck well; Unique dual-purpose and folding design; Fibers is naturally breathable, quick-drying materials. Wide Large Brim Sun Hat Summer UV Protection Thin Hat 2 in 1 Beach Sun Hat - Suitable to wear in Spring, Summer and Autumn, Beach and other outdoor activities. Perfect gift for friend, these will quickly become their favorite everyday item! Comfortable to wear. Foldable, portable. Suitable to wear in Spring, Summer and Autumn. MC160122000012 - 2-in-1 visor / sun hat. Fibers is naturally breathable, allowing heat to escape and air to flow - Great for summer wear. Simple, unique, 2 in 1 removable visor hats. Perfect for various outdoor activities such as hiking, gardening, and biking. Offers protection from harmful UV rays and shields eyes from the bright sun. Must-have accessory for yourself, your friends, and family!Material: 65%Cotton+35%PolyesterSize: Circumference: 21. 2", height:3", brim: 4"package includes:1 x Visor Hat Dual purpose design, Disconnecting the zipper is Visor cap. Foldable, portable. Storage & packable while still maintaining its shape, its compactable size makes it easy to store anywhere & Travel-Friendly - This ladies visor sun hat is foldable & carried in your bag on-the-go for travels. EPGW Women's UV Protection Wide Brim Summer 2in1 Visor Sun Hat - Versatile accessory - our foldable summer visor hat is perfect for various outdoor activities such as golf, picnicking at the park, hiking, tennis, camping, and more; It also makes a great gift for friends and family. Material: Polyester Cotton. Size: hat circumference: 56-60cm, Hat brim: 11cm. Feature: fashion women/ladies/girls foldable sun block anti uv protection sunhat; Large wide brimmed with butterfly knot, allowing heat to escape and air to flow; Lightweight, protect your whole face and neck well; Unique dual-purpose and folding design; Fibers is naturally breathable, quick-drying materials. Suitable to wear in Spring, Summer and Autumn, Beach and other outdoor activities. Perfect gift for friend, these will quickly become their favorite everyday item! - Walking to your garden or go outside with our ihomey sunhat, you don't need to worry about the sunburn anymore 2-in-1 Smart Designer Hat & Complete Any Outfit On Any Occasion It is convertible, designed with the detachable zip top and removable neck scarf, it's like getting 3 hats in one! You will love the fact that you can wear it as a large brim hat or a visor hat and wear it with the floral pattern scarf or not. Sun protection, Anti UV. This folding sunhat enables you to roll up it in your tote or suitcase and takes anywhere. Comfortable to wear. Back features: fabric covered elastic, adjustable bow and opening for ponytail if needed. Hand Washable. Unique 2-in-1 design - features a zipper that removes the top part of the hat away from the visor section, so you can wear it either as a hat to cover your head or simply as a wide-brimmed visor. Roll Up Wide Brim Sun Visor UPF 50+ UV Protection Sun Hat with Neck Protector - Customized fit & keep you cool all day: adjustable with the hook&loop on the back for a comfortable fit. Ihomey sun protective upf 50+ large brim foldable flora beach sun hat visor upf 50+ guarantee & full Sun Protection Cap This hat with special anti-UV treatment, completely keep the sun off your face, and designed with 14cm large brim to definitely prevent more than 98% of all UV rays, neck and shoulder. Removable neck protector scarf & uv protection upf 50+: easily attached to the sun cap or form to a butterfly knot on back, not only keep you fashion, also provide the maximum 360 degree protection for face, ears, neck. Roll up and take anywhere: with flexible wiring within the brim seam, shape it into the style you want. Stylish 2-in-1 designer sun hat: wear it as a sun hat or zip off the top to turn into a sport sun-visor, allow for all the outdoor activities travel beach swimming cycling trekking camping and more. - Storage & travel-friendly - this ladies visor sun hat is foldable & packable while still maintaining its shape, its compactable size makes it easy to store anywhere & carried in your bag on-the-go for travels. Versatile accessory - our foldable summer visor hat is perfect for various outdoor activities such as golf, tennis, camping, picnicking at the park, hiking, and more; It also makes a great gift for friends and family. Material: Polyester Cotton. Size: hat circumference: 56-60cm, Hat brim: 11cm. Feature: fashion women/ladies/girls foldable sun block anti uv protection sunhat; Large wide brimmed with butterfly knot, allowing heat to escape and air to flow; Lightweight, protect your whole face and neck well; Unique dual-purpose and folding design; Fibers is naturally breathable, quick-drying materials. JFH Women's Classic Quintessential Sun Wide Visor Golf Hat - Suitable to wear in Spring, Summer and Autumn, Beach and other outdoor activities. Perfect gift for friend, these will quickly become their favorite everyday item! 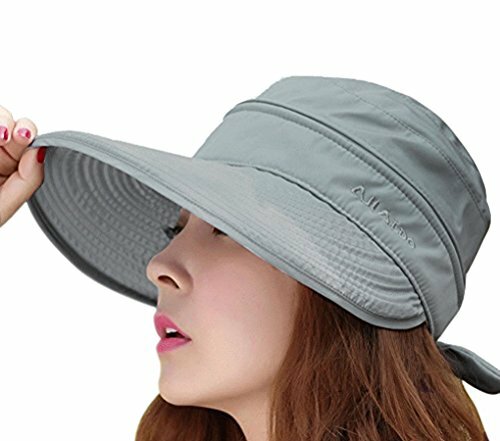 Stylish 2-in-1 designer sun hat: wear it as a sun hat or zip off the top to turn into a sport sun-visor, allow for all the outdoor activities travel beach swimming cycling trekking camping and more. Suitable to wear in Spring, Summer and Autumn. Classic functionality: 4" brim & 4. 5" crown ensures proper shade from the sun, while maintaining classic timeless style. This hat is made of extremely flexible and durable lightweight fabric, lining moisture wicking cotton to keep you cool and comfortable all day. NT2381 - Decoration with flora band: this colorful band on hat can complete with all of your holiday outfits, looks how attractive and charming you are. We've created variety of classical designs, men and kids hats, divide into sun hat, winter hat, include women, beanie etc. Like some "one size fits all" can be. Please say no to piratical products. Hindawi, a 8 years young brand in hats' field, has been extremely popular for its unique-design and premium-quality in world market. Season:spring, Summer, Fall and Winter. Classic functionality: 4" brim & 4. 5" crown ensures proper shade from the sun, while maintaining classic timeless style. Customized fit & keep you cool all day: adjustable with the hook&loop on the back for a comfortable fit. HINDAWI Sun Hats for Women Wide Brim Sun Hat UV Protection Caps Floppy Beach Packable Visor - High quality materials & comfort: 100% Plush Cotton Construction. This folding sunhat enables you to roll up it in your tote or suitcase and takes anywhere. Suitable to wear in Spring, Summer and Autumn. Brim span 14cm, head circumference 22-24", fits almost all women and girls. Sun protection, Anti UV. 100% satisfaction, money back Guarantee! Dual purpose design, Disconnecting the zipper is Visor cap. - Hand Washable. Completely re-designed for 2017 spring. Back features: fabric covered elastic, adjustable bow and opening for ponytail if needed. Sun protection: the womens sun hat with wide brim effectively keeps you away from UV or other harmful rays and offers your skin considerate care. High-end material: superior polyester fabric guarantees lightweight and breathable quality for the sun hat. High-density sweatband and mesh ensure excellent heat dissipation and comfortable dressing experience. Unique style: beautiful flowers and pearl decoration on the hat brim show your feminine charm. Removable neck protector scarf & uv protection upf 50+: easily attached to the sun cap or form to a butterfly knot on back, ears, also provide the maximum 360 degree protection for face, not only keep you fashion, neck. Mleyrtio Women's Anti-UV Lightweight Sun Hat Wide Brim 2in1 Visor Tennis Golf Hats - Roll up and take anywhere: with flexible wiring within the brim seam, shape it into the style you want. Classic functionality: 4" brim & 4. 5" crown ensures proper shade from the sun, while maintaining classic timeless style. Decoration with flora band: this colorful band on hat can complete with all of your holiday outfits, looks how attractive and charming you are. Comfortable to wear. Unique 2-in-1 design - features a zipper that removes the top part of the hat away from the visor section, so you can wear it either as a hat to cover your head or simply as a wide-brimmed visor. Sun protection, Anti UV. NT2380 - Fibers is naturally breathable, allowing heat to escape and air to flow - Great for summer wear. It is pony tail design, you can pull your hair out the back and its adjustable. Chin strap: the uv protection sun hat comes with a chin strap, to keep the hat from flying off in the wind. Fibers is naturally breathable, golf, Beach, allowing heat to escape and air to flow - Great for summer travel, Tennis and other outdoor activities. Large, wide brim - provides good protection for your face from the harmful UV rays. Material:made of high quality material, Superior polyester fabric. Occasion:perfect for fishing, biking, boating, summer camp, hiking, travel or beach vacation. Disclaimer:uspto trademark hiNDAWI, serial number: 86655765. Like some "one size fits all" can be. HINDAWI Sun Hats Women Wide Brim UV Protection Summer Beach Packable Visor - Sun protection: the womens sun hat with wide brim effectively keeps you away from UV or other harmful rays and offers your skin considerate care. High-end material: superior polyester fabric guarantees lightweight and breathable quality for the sun hat. High-density sweatband and mesh ensure excellent heat dissipation and comfortable dressing experience. Unique style: beautiful flowers and pearl decoration on the hat brim show your feminine charm. 2-in-1 visor / sun hat. - Adult sizing: adult's hat measure's 7 1/4" for internal diameter. It is pony tail design, you can pull your hair out the back and its adjustable. Chin strap: the uv protection sun hat comes with a chin strap, to keep the hat from flying off in the wind. It is foldable for easy storage or for taking on the go while traveling, quiet convenient. Special velcro: effortless and free to adjust the suitable size. Our products are designed and created to provide unparalleled quality and functionality. Large, wide brim - provides good protection for your face from the harmful UV rays. 2-in-1 visor / sun hat. Packable design can be put in bag. Decoration with flora band: this colorful band on hat can complete with all of your holiday outfits, looks how attractive and charming you are. Jemis Women's X-Large Brim Sun Visor - Customized fit & keep you cool all day: adjustable with the hook&loop on the back for a comfortable fit. Uv sun protection - provides extra uv protection from harmful sun rays by shielding your eyes & face with its' long visor bill & helps you stay cool as you enjoy your outdoor activities in the sun. Dual purpose design, Disconnecting the zipper is Visor cap. Back features: fabric covered elastic, adjustable bow and opening for ponytail if needed. It is foldable for easy storage or for taking on the go while traveling, can be attached to both side, quiet convenient.